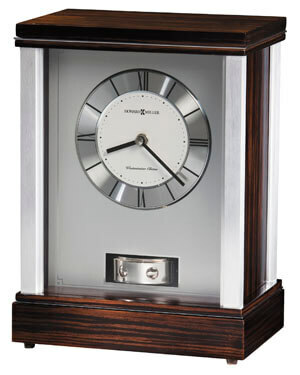 This mantel clock features brushed aluminum corners and polished silver-tone accents which complement the faux Macassar Ebony finished top and base. Brushed aluminum dial features an applied circular, brushed aluminum numeral ring with black Roman numerals and hour markers; satin silver center; and glass crystal. You will save $85.80 (30 %) on this Howard Miller Gardner 635-172.